Michael J. Bowler is an award-winning author of three novels––A Boy and His Dragon, A Matter of Time, and Children of the Knight––who grew up in San Rafael, California. He partnered with two friends as producer, writer, and/or director on several ultra-low-budget horror films including “Fatal Images,” “Club Dead,” and “Things II.” He has been a volunteer Big Brother to seven different boys with the Catholic Big Brothers Big Sisters program and a long-time volunteer within the juvenile justice system in Los Angeles. He is a passionate advocate for the fair treatment of children and teens in California, something that is sorely lacking in this state. He has been honored as Probation Volunteer of the Year, YMCA Volunteer of the Year, California Big Brother of the Year, and National Big Brother of the Year. The “National” honor allowed he and three of his Little Brothers to visit the White House and meet the president in the Oval Office. He has already completed the sequel to Children of the Knight and is hard at work on the third volume in the trilogy. 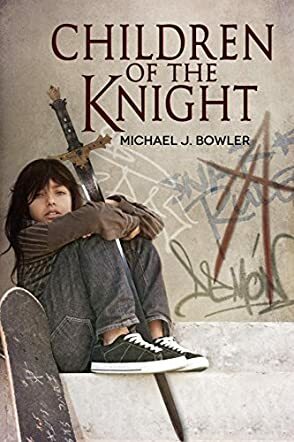 "Children of the Knight" by Michael J Bowler is a book that will leave quite an impact on you, no matter whether you are a young adult or a pensioner. It is a story about how our society lets down the members who would need its care most: abandoned children, the ones no one really cares for and who have to fend for themselves on the road - either by selling drugs, being in a gang or even selling themselves as prostitutes. But when a man who calls himself King Arthur appears in the life of Lance, one of the children in the book, it looks as though the world could change for the better. After all, it is said that the King would appear again in the hour of need. But who would believe someone who says he is the famous king of old? Can one man and a group of children change society? I chose to read this book because I like the legends that surround King Arthur and his round table and it interested me what King Arthur would think about our world and how he could ever get used to it. In "Children of the Knight", Michael J Bowler manages to show how a man from a totally different point in time perceives our society and how easy it is for him to immediately see the weak points of it. King Arthur is the knight many people dream of - the one person who could turn things around and make people believe in a better future. The story becomes better page after page and at a certain stage you can't put the book down until you arrive at the end. It is a very moving story and makes you wonder about how good our society really is and whether we care enough about the weak links in it.